"Intelligent Video Analytics Platform for Big Data Technology"
Why You Should Use intelligent Video Analytics platform?? An intelligent video analytics platform can help you to handle massive amounts of video or image input data and produce results in real time. The complex process of converting unstructured video data to a structured visual realization in a parallel context can be done with Big Data Video Analytics easily. So would you like to employ an intelligent big data video analytic tool and cloud based platforms to scale up the computer vision algorithms? If Yes! 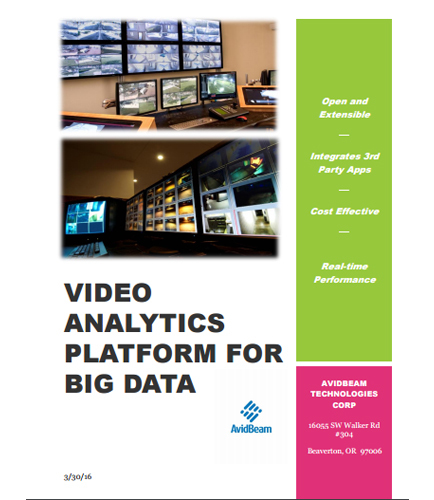 Read this whitepaper that gives you a brief insight of video analytics platform for big data for better business intelligence. Why intelligent video analytics platform will be the next big thing in big data? Why intelligent video analytics platform is the most untapped source of data? What are benefits of implementing intelligent video analytics platform? How to select the best platform for performing Video Analytics? How to handle Video Processing with Big Data Tools?